The Club Willoughby Stamp Club benefits from generous rooms with good lighting and wheelchair access, as well as all the facilities of the main club just a few metres away. The meeting rooms are on the main city to Chatswood bus route, but a car lift can be arranged as convenient. The monthly meetings are very sociable, with a good mix of men and women. Guest displays, a generous evening 'cuppa', the sale by tender, and a good chinwag all make for a satisfying evening. Every evening concludes with a sale by tender of Member's excess stamp material. Fourth Thursday of each month (except December), Commencing at 7:30 pm. 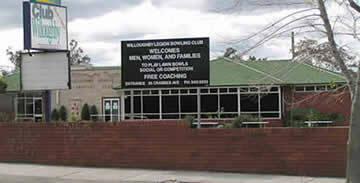 Club Willoughby, The Annex (Bowling Club House), 26 Crabbes Avenue, Willoughby NSW 2068 (see map below). (see map below ). Annual Membership to Club Willoughby $10.00 per year. Subscription to the Philatelic Section $5.00. Subscription accepted on proof of membership of Club Willoughby. Ryde Ex Services Memorial & Community Club, entry from Cowell Street or lower car park in Eagle Street.